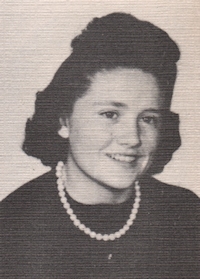 Obituary – Thompson, Ethel Delores (Kemnitz) « Perry High School Alumni Association, Inc.
Ethel Delores Thompson, 74, of Perry, Oklahoma, was the daughter of Ernest John and Hilda Dorthea (Buchholz) Kemnitz. She was born February 28, 1929, in Perry, Oklahoma and died unexpectedly at 9:15 p.m. Monday, March 24, 2003 at Stillwater Medical Center in Stillwater, Oklahoma. Funeral services will be at 2:30 p.m. Thursday, March 27, 2003, at Christ Lutheran Church in Perry. Rev. William Metz will officiate. Interment will be in Grace Hill Cemetery at Perry under direction of Brown-Dugger Funeral Home. Memorials may be made to the American Heart Association in care of Brown-Dugger Funeral Home. Ethel and Jack Thompson were married May 24, 1947, in Wellington, Kansas. She was a homemaker who loved her family and spoiled her children and grandchildren. She was an avid bowler and Chicago Cubs baseball fan. She also enjoyed crossword puzzles, reading and traveling. 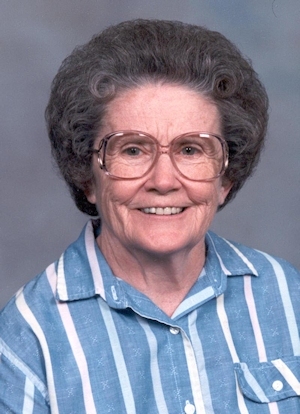 Ethel was a member of Christ Lutheran Church, unit 5 of the Lutheran Women’s Missionary League, the Perry Women’s Bowling Association and the Cherokee Strip Historical Society. Survivors, in addition to her husband, Jack, are four sons, Gary Thompson and his wife, John Ann, of Grove, Oklahoma, Randy Thompson, Perry, Oklahoma, Mike Thompson and his wife, Denise, Enid, Oklahoma, and Brad Thompson, Perry, Oklahoma; one daughter, Peggy Haxton and her husband, John, Perry, Oklahoma; one brother, E.J. Kemnitz Jr., Omaha, Nebraska; one sister, Rosie Kemnitz, Perry, Oklahoma; nine grandchildren, six great-grandchildren and one great-grandchild-to-be.